Christ Before Caiaphas, by Matthias Stom. Joseph Caiaphas, known simply as Caiaphas (Hebrew: יהוסף בר קיפא‎);(Greek: Καϊάφας) in the New Testament, was the Jewish high priest who is said to have organized the plot to kill Jesus. Caiaphas is also said to have been involved in the Sanhedrin trial of Jesus. According to the Gospel accounts, Caiaphas was the most hostile enemy of Jesus. The 1st-century Jewish historian Josephus is considered the most reliable literary source for Caiaphas. His works contain information on the dates for Caiaphas' tenure of the high priesthood, along with reports on other high priests, and also help to establish a coherent description of the responsibilities of the high-priestly office. Josephus (Antiquitates Judaicae 18.33-35) relates that Caiaphas became a high priest during a turbulent period. He also states that the proconsul Vitellius deposed him (Antiquitates Judaicae 18.95-97). Josephus' account is based on an older source in which incumbents of the high priesthood were listed chronologically. According to Josephus, Caiaphas was appointed in AD 18 by the Roman prefect who preceded Pontius Pilate, Valerius Gratus. In November 1990, workers found an ornate limestone ossuary while paving a road in the Peace Forest south of the Abu Tor neighborhood of Jerusalem. This ossuary appeared authentic and contained human remains. An Aramaic inscription on the side was thought to read "Joseph son of Caiaphas" and on the basis of this the bones of an elderly man were considered to belong to the High Priest Caiaphas. 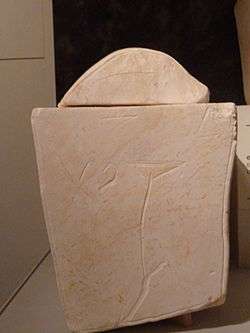 Since the original discovery this identification has been challenged by some scholars on various grounds, including the spelling of the inscription, the lack of any mention of Caiaphas' status as High Priest, the plainness of the tomb (although the ossuary itself is as ornate as might be expected from someone of his rank and family), and other reasons. In June 2011, archaeologists from Bar-Ilan University and Tel Aviv University announced the recovery of a stolen ossuary, plundered from a tomb in the Valley of Elah. The Israel Antiquities Authority declared it authentic, and expressed regret that it couldn't be studied in situ. It is inscribed with the text: "Miriam, daughter of Yeshua, son of Caiaphas, Priest of Ma’aziah from Beth ‘Imri". Based on it, Caiaphas can be assigned to the priestly course of Ma’aziah, instituted by king David. In the Gospel of Matthew 26:57-67, Caiaphas and other chief priests who dominated the Sanhedrin of the time are depicted interrogating Jesus. They are looking for false evidence with which to frame Jesus, but are unable to find any. 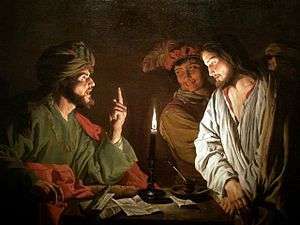 Jesus remains silent throughout the proceedings until Caiaphas demands that Jesus say whether he is the Christ. Jesus replies "You have said so" (Σὺ εἶπας) 26:64, and "I am: and you will see the Son of Man seated at the right hand of power, and coming on the clouds of heaven." 14:62 Caiaphas and the other men charge him with blasphemy and order him beaten. In the Gospel of John 11, the high priests call a gathering of the Sanhedrin in reaction to the raising of Lazarus. Later, Caiaphas and the chief priests extend this decision to also include Lazarus himself 12:10. The parallel with the reaction of the "five brothers" to any raising of Lazarus in the account in the Gospel of Luke 16:28-30 has given rise to the suggestion by Claude-Joseph Drioux and others that the "rich man" is itself an attack on Caiaphas, his father-in-law, and his five brothers-in-law. Caiaphas considers, with "the Chief Priests and Pharisees", what to do about Jesus, whose influence was spreading. They worry that if they "let him go on like this, everyone will believe in him, and the Romans will come and destroy both our holy place and our nation." Caiaphas makes a political calculation, suggesting that it would be better for "one man" (Jesus) to die than for "the whole nation" to be destroyed. In John 18, Jesus is brought before Annas and Caiaphas and questioned, with intermittent beatings. Afterward, the other priests (Caiaphas does not accompany them) take Jesus to Pontius Pilate, the Roman governor of Judea, and insist upon Jesus' execution. Pilate tells the priests to judge Jesus themselves, to which they respond they lack authority to do so. Pilate questions Jesus, after which he states, "I find no basis for a charge against him." Pilate then offers the gathered crowd the choice of one prisoner to release — said to be a Passover tradition — and they choose a criminal named Barabbas instead of Jesus. Caiaphas was the son-in-law of Annas by marriage to his daughter and ruled longer than any high priest in New Testament times. For Jewish leaders of the time, there were serious concerns about Roman rule and an insurgent Zealot movement to eject the Romans from Israel. The Romans would not perform execution over violations of Halakha, and therefore the charge of blasphemy would not have mattered to Pilate. Caiaphas' legal position, therefore, was to establish that Jesus was guilty not only of blasphemy, but also of proclaiming himself the Messiah, which was understood as the return of the Davidic kingship. This would have been an act of sedition and prompted Roman execution. Later, in Acts 4, Peter and John went before Annas and Caiaphas after having healed a crippled man. Caiaphas and Annas questioned the apostles' authority to perform such a miracle. When Peter, full of the Holy Spirit, answered that Jesus of Nazareth was the source of their power, Caiaphas and the other priests realized that the two men had no formal education yet spoke eloquently about the man they called their saviour. Caiaphas sent the apostles away, and agreed with the other priests that the word of the miracle had already been spread too much to attempt to refute, and instead the priests would need to warn the apostles not to spread the name of Jesus. However, when they gave Peter and John this command, the two refused, saying "Judge for yourselves whether it is right in God's sight to obey you rather than God. For we cannot help speaking about what we have seen and heard." According to Helen Catharine Bond, there may be some references to Caiaphas in the rabbinic literature. The Babylonian Talmud (Yevamot 15B) gives the family name as Kuppai, while the Jerusalem Talmud (Yevamot 1:6) mentions Nekifi. The Mishnah, Parah 3:5, refers to him as hakKof "the Monkey", a play on his name for opposing Mishnat Ha-Hasidim. In Inferno, Dante Alighieri places Caiaphas in the sixth realm of the eighth circle of Hell where hypocrites are punished in the afterlife: his punishment is to be eternally crucified across the hypocrites' path, who eternally step on him. Caiaphas is mentioned in the 19th verse of The Ballad of Reading Gaol by Oscar Wilde. Caiaphas is mentioned throughout the works of William Blake as a byword for a traitor or Pharisee. Caiaphas and his ossuary are the subject of Bob Hostetler's novel, The Bone Box (Howard Books, 2008). He is also shown as influencing Pontius Pilate in passing the death sentence against Jesus in The Master and Margarita by Bulgakov. 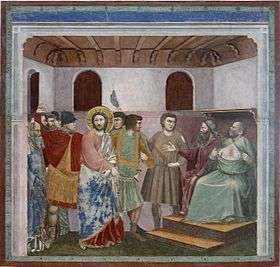 Christ Before Caiaphas, Antonio della Corna. Walters Art Museum. Actors who have portrayed Caiaphas include Rudolph Schildkraut in Cecil B. DeMille's film King of Kings 1927, Guy Rolfe in Nicholas Ray's film King of Kings (1961), Rodolfo Wilcock in Pier Paolo Pasolini's film The Gospel According to St. Matthew (1964), Martin Landau in George Stevens' film The Greatest Story Ever Told (1965), Bob Bingham in Norman Jewison's film Jesus Christ Superstar (1973), Anthony Quinn in Franco Zeffirelli's television miniseries Jesus of Nazareth (1977), Mattia Sbragia in Mel Gibson's film The Passion of the Christ (2004), and Adrian Schiller in the TV miniseries The Bible (2013) and the film Son of God (2014), both by same production team, and Richard Coyle in NBC’s miniseries by Mark Burnett and Roma Downey A.D. The Bible Continues. ↑ Bond, Caiaphas, pp. 18-19. ↑ Bond, Caiaphas, p. 86. ↑ Josephus' source is mentioned in Antiquitates Judaicae 20.224-51 and Against Apion 1.36; see Bond, Caiaphas, p. 163, n. 2. ↑ "Tomb May Hold the Bones Of Priest Who Judged Jesus"
↑ Bond, Helen Katharine (2004). Caiaphas: friend of Rome and judge of Jesus?. Westminster/John Knox Press. pp. 4–8. ISBN 978-0-664-22332-8. ↑ CNN Wire Staff (2011-06-30). "Israeli authorities: 2,000-year-old burial box is the real deal". CNN. Retrieved 2011-08-26. ↑ For a discussion of Tosefta Yevamot 1.10 and other possible rabbinic references, see Bond, Caiaphas, p. 164, n. 3. Metzger, Bruce M. (ed) (1993). Michael D. Coogan, ed. The Oxford Companion to the Bible. Oxford, UK: Oxford University Press. ISBN 0-19-504645-5. Bond, Helen Catharine (2004). Caiaphas: Friend of Rome and Judge of Jesus?. Louisville: Westminster John Knox. ISBN 0-664-22332-X. Wikimedia Commons has media related to Caiaphas.